Originally uploaded by Drake Memorial Library, SUNY Brockport. Today our Interim Library Director stumbled upon this signage. 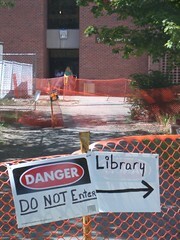 "Danger: DO NOT ENTER Library ->"
It has been an upward battle to get people into the library during the construction this summer. At one point last week, even our main/only public entrance was taped off for construction. So people were routed through fire doors to the side. The best hockey team on earth!